I love the juxtaposition of the white walls and bed with the dark ceiling and books but…I have to say I’m not sure I’d find anything on those shelves I’d want to read. They have the look of books bought for appearances sake only. To my way of thinking, there are few sins greater than wasting shelf space displaying books you don’t intend to read. Oh, but I’d still put aside my current thinking of “no books in the bedroom” for this room! Stop by my blog if you like….I have a giveaway for a murder mystery. It’s attractive, but I, too, wonder if this person is a reader. Where is the reading lamp? Maybe recessed above the bed? Just doesn’t look like a bedroom for a real reader. I like the painting on the wall to the left. This definitely could be “personalized” with “real” books and be made into a haven. 🙂 It looks like it was staged for a themed shot in a magazine. I agree and would love a better look at the painting. I absolutely adore this and would do it in my bedroom immediately if I could. Yes, these are antique books so perhaps the person is a collector. Just posted up book shop photos from Beriloche Argentina, having fun looking a bookish things here. Stop by if you’re interested in south America for a couple of weeks. Love your posts! 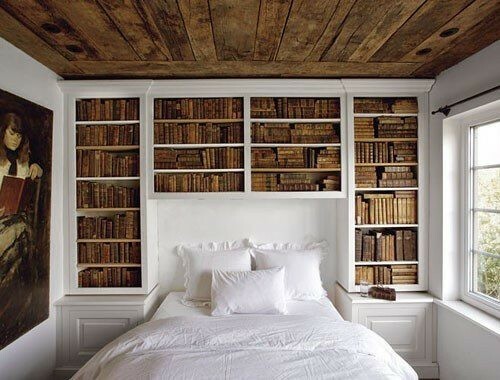 The picture is nice to look at, but I definitely wouldn’t want to live in a bedroom lined with books-for-decoration. Lets hope that this was just for the photo and that in real life the books are much loved and much read 🙂 Gorgeous photo! Agreed, it’s beautiful but it’s not a reader’s room. They wouldn’t touch those dirty books (and life in a rare books department taught me how dusty and filthy they are!) with white everywhere. I agree the room is gorgeous but wouldn’t want to live in it the way it it. I’d remove all those books and fill it up with my own colourful spines! Love the painting on the left wall! I love the built in surfaces next to each side of the bed too! Oh my, I think I might not ever get out of bed if that were mine! I would love waking up with the sun beaming in. but I agree, what a waste of space! I barely find enough room on the shelves I have now, let alone for books just for show! That’s the ultimate bed head board lol.